How sweet! We have a teeny tiny stella di Natale that we couldn’t resist bringing home from Maiori a couple of weeks ago. I’ve never had one before, and I didn’t realize they could live so many years. Any tips?? I’m glad you got a new one this year! Wishing you a wonderful and happy 2011!! I really don’t have tips on making it live (just water now and again), but if you want it to really bloom (i.e., have red leaves for Christmas), you have to put it in the complete dark for about 12 hours a day beginning in September — they say. 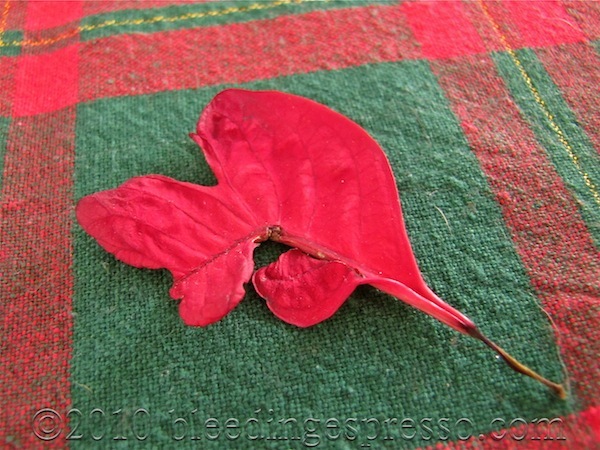 We never did that, so it never got the full lush red leaves like the first year, but it always had some red leaves anyway. That’s something, btw, I learned quickly about the poinsettia once I researched it (after it didn’t just die after that first Christmas): that the red parts aren’t really the flowers, they’re just regular green leaves turned red because in nature they don’t get very much sun for a few months and POW! Red! Pretty cool! 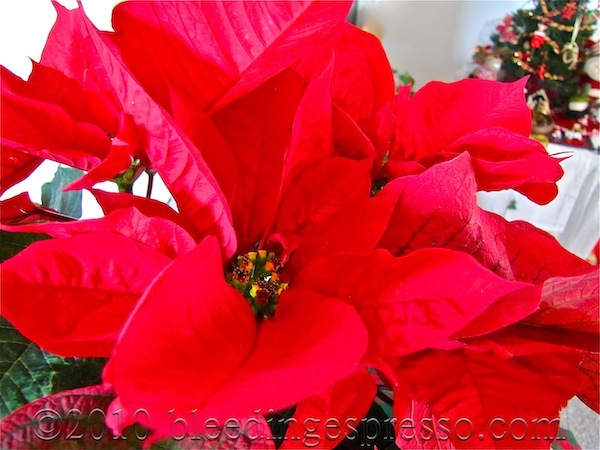 I love Poinseta’s but they donot love me, so when ever someone makes a gift aof one to me, I keep it for a few days and pass it on, I don’t want to be the poinseta killer. Have a very happy, healthy new year! I did too Pat! 🙂 Buon 2011! That is so cool…hope it makes it for many years to come! Good luck with the new one! I don’t think we ever got more than one season out of one. Gil, that was the first time for me as well — it had a good run for sure! your love thursday serie make me smile!i admire you for the ability to find and see love in everything around us…. keep up this positive spirit and have a great new 2011 full with love, smiles and happiness! Thanks Jana; same to you!